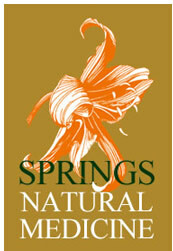 Springs Natural Medicine makes no warranties or representations, express or implied, as to the accuracy or completeness, timeliness or usefulness of any opinions, advice, services or other information contained or referenced in this website. Springs Natural Medicine does not assume any risk for your use of this website. Users of this website should be aware that the materials and content contained in this website are only updated periodically; such materials or content may not contain the most recent information available. Springs Natural Medicine reserves the right to update or change information contained in this website at any time. Springs Natural Medicine is not responsible for information appearing at hyperlinks. In consideration for your use of and access to this website, you agree that in no event will Springs Natural Medicine or any other party involved in creating, producing or delivering this website or any site linked to this website, be liable to you in any manner whatsoever for any decision made or action or non-action taken by you in reliance upon the information provided through this website.